This was our first two classes with Susan Butler, our Design in Enterprise tutor. The first class was an introduction presentation, the second was all about getting out with "customers." I am delighted to discover we have a photo of our board, hat tip to whoever uploaded it to the shared drive! 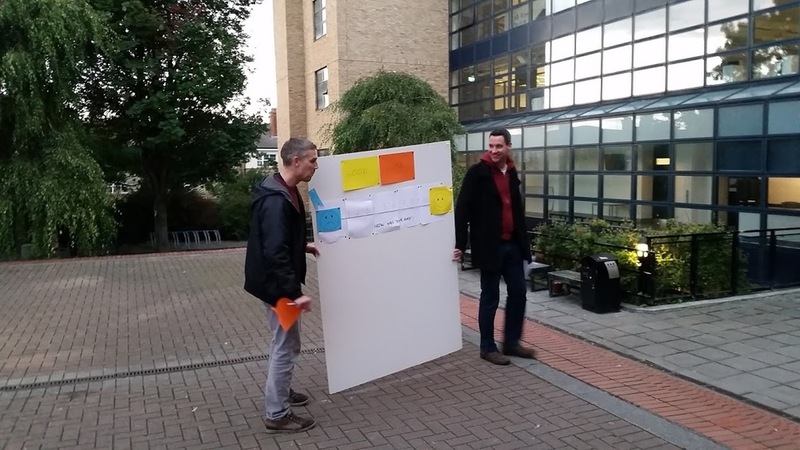 We were thrown into the deep end of design research and sent out onto the streets to solicit feedback from passers by. Our goal was simple, to find out what constitutes "The Good Life" from the people on Thomas Street. Our target are was the footfall sweet spot between NCAD and Lidl. We were given ten minutes to prepare whatever tools we needed. What we decided to do was use one of the large presentation boards to make a happiness scale from one to ten and wrote in large letter above "How was your day." The plan was to get passers by to pin a balloon where best represented how good their day was. It was pretty ad-hoc but it worked to some degree. We spoke to about 10 people in the hour we were out there. It was hard, given we had such little time to prepare, but the lesson was well learned. Having a big prop is great for catching peoples eye. The hardest part was having the right questions to get the most conversation out of people. The biggest lesson learned from the excercise was that you don't need time to get feedback, you just need to get out there and do it!